Oftentimes you will read or be told to rub your feet across a coke bottle, a tennis ball or a frozen plastic bottle to relieve heel pain and planter faciitis. Although this may help, there is a product you can use that could be more effective. Rubbing the bottom of your foot helps massage the inflammation away. Something like rubbing a sore area of your forearm after banging it against the corner of a wall. However, the anatomy of the heel bone is not flat and thus in order to evenly massage the area, you need to be able to get into the “nooks and crannies” of the foot. The fascia and muscles on the bottom of your foot extend from the bottom of the heel bone toward the toes. The bottom of the heel bone is somewhat flat near the back of your foot but it then courses upward toward your arch. Where the heel bone begins coursing upward is usually where the inflammation and pain is significant. To relieve pain, it is critical to massage this area. Because the heel bone goes upward, it may be difficult to deeply massage this area with simply a coke bottle or large object. That is why we recommend FootRubz. FootRubz is a plastic ball about the size of a large golf ball. It easily follows the contours of the bottom of your foot reaching the deep area of your heel and extending into the arch. Furthermore, it has multiple rubber-like nubs all around it contrary to dimples on a golf ball. These nubs will act like multiple fingers tapping the tissues achieves a Tapotement-like massage. We recommend using the The FootRubz Massage Ball morning and night for about 5 minutes. It will also stimulate acupressure points in your feet, helping to relieve soreness and pain. Roll this nubby designed ball under your feet, or any sore or tired muscle and you can feel the beginning of tension release. You’re in control of the depth of massage with applied pressure to ensure the utmost relief of soreness. 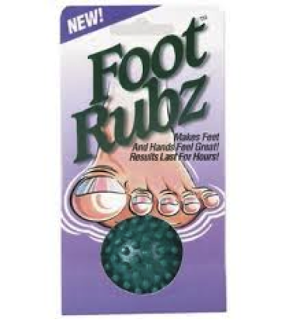 The Foot Rubz is great to use for symptoms of plantar fasciitis. Small enough to fit in the palm of your hand, and I’ve used it on my hands too, the Foot Rubz massage ball is great for use nearly anytime, anywhere. 160 nubs to stimulate relax and eliminate tension. Compact, small size not only to reach those nooks and crannies of your feet and hands but also easily stored and carried in your handbag, sport bag, briefcase or desk. Simple to use and no excuse to not perform nearly anywhere. Stop by ArchMasters or call 615-370-3000 today to receive your complimentary consultation with Dr. David Sables and walk away from pain fast. ArchMasters-Orthotics, Shoes & Footcare, LLC. Nashville’s only shoe store with a Doc in every shoebox!